Christmas is just around the corner and a Philips Sonicare electric toothbrush makes a great gift for anyone in your family. But don’t pay full price if you don’t halve to. I’ve been searching for the past few days for current coupons, rebates and sales online and locally and I’ve compiled a list of all the savings I’ve been able to find for November 2018. If you’ve found another promotion I’ve missed, a Black Friday sale or a rebate please share it on our Facebook page. First up this month I searched the Bargain Bin Betty Coupon Database and found a single $5 off coupon for Brush Head multi packs. This is available from the company website @ https://www.usa.philips.com/c-m-pe/electric-toothbrushes I took a screen shot of my search results and posted it below. 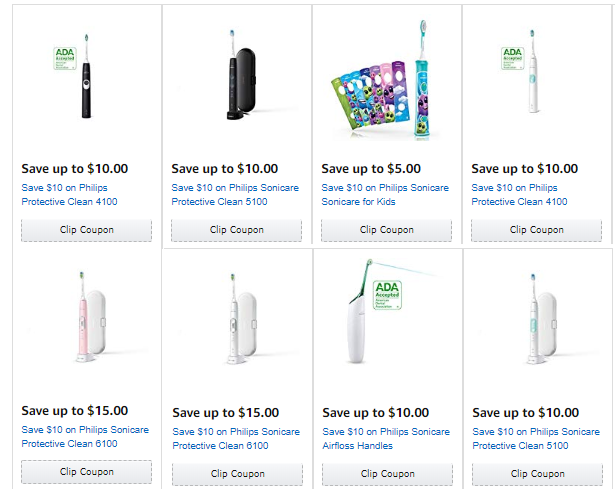 Next up Amazon has several coupons for the Sonicare protective clean 4100, 5100, 6100 for kids and Air floss. Savings are from $5 to $15 off retail price and best of all on Amazon you can generally find it cheaper then in stores. These coupon’s should be available until the end of November. I also found some great deals at Costco today that will save you $30 off a Sonicare 7000 2 pack and $10 off Replacement brush heads. This promotion is valid till the 26th of November 2018. Head down to your local Costco to take advantage of these deals. Next up I had a look for any Philips Sonicare rebates and found a few! 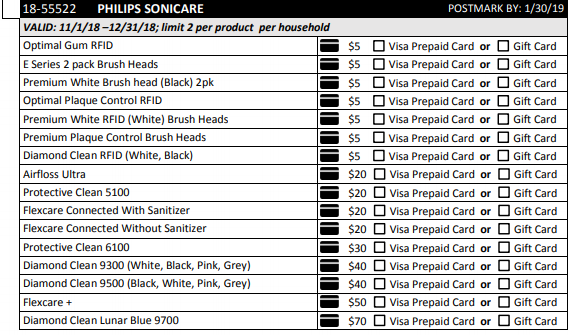 First up the $5 Sonicare rebate posted back in October is still valid. You can print off a copy here here it’s valid till December 31st 2018 that will save you $5 off and get you an extra 6 month warranty!! If you’ve found any other deals or have a question feel free to check out our Facebook page for more coupons and promotions other fans have shared this month! This entry was posted in Philips Sonicare Coupons, Sonicare Rebate Forms, Uncategorized and tagged 2018, Amazon, Costco, November, rebate, Sonicare coupon. ← Here’s 3 Ways To Save $$$ On A Sonicare Electric Toothbrush For October!